Wisconsin Historical Society Press, 9780870208492, 228pp. Hit the trail for a dramatic look at Wisconsin’s geologic past. The impressive bluffs, valleys, waterfalls, and lakes of Wisconsin’s state parks provide more than beautiful scenery and recreational opportunities. They are windows into the distant past, offering clues to the dramatic events that have shaped the land over billions of years. Author and former DNR journalist Scott Spoolman takes readers with him to twenty-eight parks, forests, and natural areas where evidence of the state’s striking geologic and natural history are on display. In an accessible storytelling style, Spoolman sheds light on the volcanoes that poured deep layers of lava rock over a vast area in the northwest, the glacial masses that flattened and molded the landscape of northern and eastern Wisconsin, mountain ranges that rose up and wore away over hundreds of millions of years, and many other bedrock-shaping phenomena. These stories connect geologic processes to the current landscape, as well as to the evolution of flora and fauna and development of human settlement and activities, for a deeper understanding of our state’s natural history. 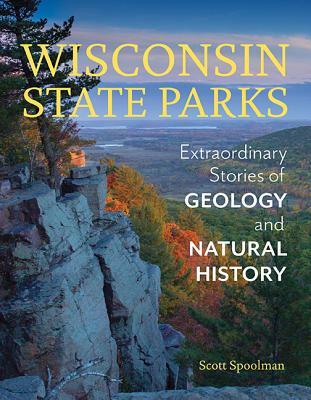 The book includes a selection of detailed trail guides for each park, which hikers can take with them on the trail to view evidence of Wisconsin’s geologic and natural history for themselves.